Every wonder how artists get the look of feathers? Well I'm going to show you how to do it. It's not hard, but it is time consuming. So get yourself nice and comfy and lets get started. I'm going to show you step by step how it's done. You can follow along with me if you want, or just read through the first time then come back and follow the steps. Above all, enjoy the process, don't let it frustrate you, there is nothing like practice to get you more comfortable with colored pencils. Here is our subject. The magnificent Peregrine Falcon. I'm using Canson Mi-Teintes Light Blue paper. The light blue color was perfect for my mid tones. When you use white paper, you will find you are forever fighting the stark white. Make things easier for yourself and start with a colored paper. Lets start with the supplies you'll need. You don't have to have it all to get started, but you will find that each item will come in handy as you become more familiar with colored pencils. Colored Pencils - There are several brands of colored pencils, some easier to find than others, some better than others. My personal favorite is Prisma Color for several reasons. They are very creamy, have a wide range of colors and most of all, I can get them in my local art supply store. Never by the student grade pencil in any brand. They are too hard and don't have a very good selection of colors. If money is a factor, and it usually is with all of us, then buy just a few colors at a time of the better brand. In time you will build up a good range of colors.You should be able to pick up most of the colors at any good art supply store. 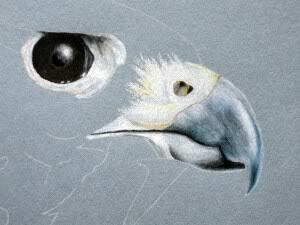 Colorless Blender - This is a colored pencil without any pigment. It's used to move the wax of the colored pencil around and smooth it down into the paper. You'll find these with the colored pencils. Pick up a couple, you will go through them faster than the pencils. Paper - The type of paper you use can make a big difference in the end result. I like Canson Mi-Teintes watercolor papers. It has enough tooth to hold several layers of color, but not so much that I have to work hard if I don't want the paper to show through. It has a smooth side and a rougher side, so be sure to check which side your using. I use the smooth side. These papers come in a variety of colors. I like to use a color that most matches the medium tones to the subject. Since the mid tones are already done, I only have to work into the darks and lights. Again, a good art supply store should carry this. If they don't have this brand, look for a medium smooth watercolor paper. Transfer paper - The watercolor paper won't hold up to a lot of erasing. So you need to do your sketching on drawing paper. When you're satisfied with the sketch, you will need to transfer it to your final work surface. I use white transfer paper if I'm using a dark paper. White transfer paper can be a bit hard to find, but if you have a fabric store near you, they have a variety of transfer colors used to transfer a pattern onto the fabric. Look for the white only, you won't use the other colors. Kneaded Eraser - Kneaded erasers are a great invention. They are pliable and can be formed into various shapes to get into small areas. They are gentle and won't damage the paper and they don't leave any crumbs behind like most erasers do. Your craft supply stores will have these. Electric Eraser - This is not something you have to have, but there are times where it's very useful. It can help when you need to remove larger mistakes. A good art supply store will carry these. The Sakura Electric eraser shown here is a good one. It doesn't have so much power to go through the paper and it's nice and small and light. Brush - This is handy to brush away any crumbs from the colored pencils or any that your eraser might leave behind. From time to time you will want to brush your surface to keep it clean. Using a soft brush will prevent any smearing. I use a soft brush from the paint store. It's inexpensive and does the job just fine. Craft Foam - This might sound like a strange thing to have, but I assure you it's very nice to have. There are times when you need a bit more pressure to get your colors down into the paper. By taping your paper to a sheet of craft foam, you will find it much more pleasant to work on. It gives you a bit of cushion. If you had your paper on a hard surface, like your table, you will find it harder to work on. It's not absolutely necessary, but they are so inexpensive it's worth it. Michaels, JoAnn's have these. Pencil Sharpener - You can start with just a hand held sharpener, but you will find an electric sharpener to be much better. The hand held sharpeners tend to break the tips and you find yourself sharpening it again and again. That's not only annoying, but wastes the pencil. I've never had break with the electric sharpener. Choose one that has an automatic shut off when the pencil is sharp. This will prevent you from grinding the pencil more than needed. Your local office supply store has lots of them. Lighting - It's important that you have good light. 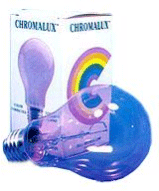 What ever light you use, get a color corrected bulb for it. It will make a big difference when you can see the actual colors you're using. Try your local hardware store for these. Extra sheet of paper - I actually use a sheet protector used for papers in a binder, but anything handy will work. This is to put under your hand and arm to keep them off the art work. It allows you to move your hand and arm without smearing your work or getting oils from your skin on the paper. That's it for the supplies. I know this looks like a lot of stuff, but you don't have to have it all to get started. If all you can get right now are a few pencils and a sheet of paper, great. It's a start and you can jump in right away. So, let's get started. 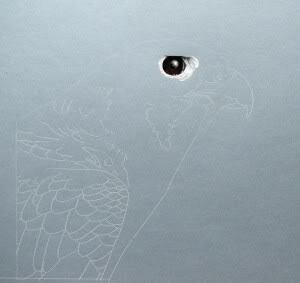 I transfer the drawing onto the paper using white transfer paper. When transferring your sketch, be very careful not to press too hard. You don't want to emboss the lines into the watercolor paper. After you have all your lines transfered, go back and lightly erase just the area you will be working on. As you work your way through the piece, erase the lines as you go. You want to just barely see them. 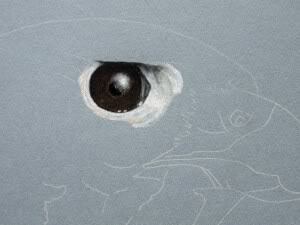 I always start with the eyes. If I'm not happy with them, the rest of the piece doesn't get done and I start over. 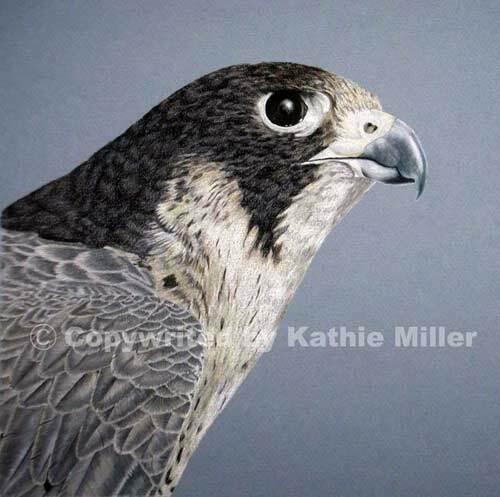 The eyes of the peregrine, in fact all the falcons, look like black marbles, but in fact, if you look really close and the light is just right, you can see the pupil and see that their eye color is actually a very dark brown. I tried to show that here. Highlight - white then blue slate. Here is a close up of the eye. I start lightly with the various colors and sort of sneak up on it. 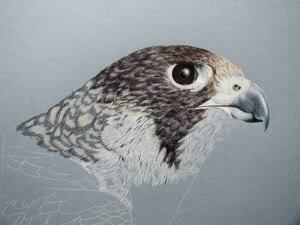 I lay down the highlights first, lightly, just to establish where they will be. Then I start with the burnt umber. Again lightly to fill in where I want it. I slowly work back and forth with the burnt umber and black, establishing the various tones. I slowly work with more and more pressure to get the color right down into the paper. Eventually using the colorless blender to really push it into the paper so none of the paper shows through. Be careful with the colorless blender. Once you use it, you can't go back and add anymore color. So be sure your satisfied with what you have before you use it. 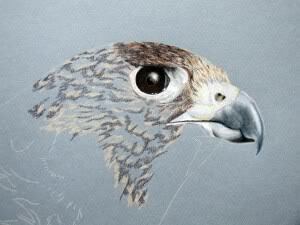 Next I do the beak. 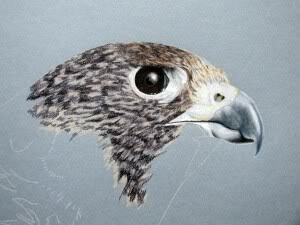 Again, I work slowly, first laying down where each color will be and slowly increase the pressure. I burnish this down completely to make it look really solid. Cere (nose area) White, cream, yellow ochre. Oops, I went to far with the head feathers and forgot to take a during picture so I took this one instead to show you the steps. First I lay down lightly the dark areas. This will be the various feather groups and individual feathers. You will notice that at this stage it looks very sketchy. That's OK, were just establishing where everything is right now. Just mapping out the feather groups. I then go back and pick out the highlights. These steps are done lightly and very scribbly. Right now, I'm just blocking in the different areas. Working with a light touch right now. Still more, back and forth with the shades to blend them and start filling in the paper. But still not going too hard with my pressure. 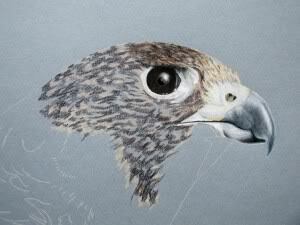 For now, I'll stop here with the head feathers. I'm sure I'll come back later to darken them, but I don't want to go too dark just yet. 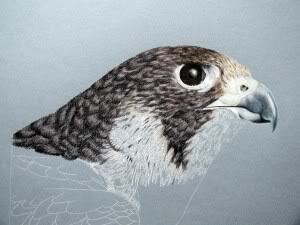 I also just blocked in the breast feathers using white just to get a sense of the tonal value around it. I'm still using the same colors mentioned above. I now start working on the back of the neck. It's the same steps here, only I try to make them a little warmer. Dark color first, highlights then the middle colors.